Control multiple computers with one keyboard, monitor and mouse console. Comes with 2 PS/2 KVM cable kits. Supports VGA, SVGA, or Multisync monitors. 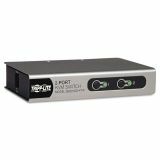 Easy to install-no software or system configurations required. 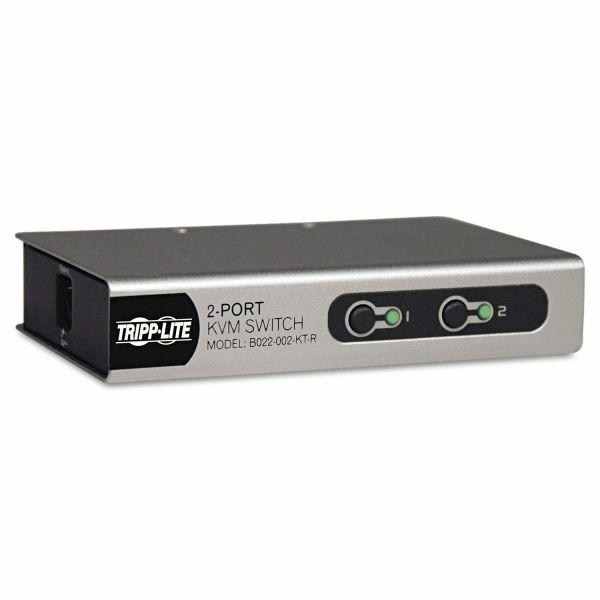 Tripp Lite 2-Port Desktop KVM Switch w/ 2 KVM Cable Kits (PS2;VGA) - Tripp Lite's B022-002-KT-R 2-port KVM Switch is the optimal solution for controlling 2 computers from one keyboard, mouse and monitor. Installation is a snap - just connect the PCs using the included PS/2 cable kits. P776-Series USB KVM cable kits are available separately for connection of USB computers. Easily switch between computers via front-panel push buttons or keyboard hotkey commands. Ultra-slim design for use in flat or vertical position. Compatible with all major operating systems except Mac and Sun.